Biltong is a form of dried, cured meat that originated in Southern African countries (South Africa, Zimbabwe, Namibia, Botswana and Zambia). Various types of meat are used to produce it, ranging from beef and game meats to fillets of meat cut into strips following the grain of the muscle, or flat pieces sliced across the grain. It is related to beef jerky in that they are both spiced, dried meats; however, the typical ingredients, taste and production processes may differ. The word biltong is from the Dutch bil ("buttock”") and tong ("strip" or "tongue"). Meat preservation as a survival technique dates back to ancient times. Indigenous peoples of Southern Africa, such as the Khoikhoi, preserved meat by slicing it into strips, curing it with salt, and hanging it up to dry. European seafarers preserved meat for their long journeys by curing meat in salt or brine. European settlers (Dutch, German, French) who arrived in southern Africa in the early 17th century used vinegar in the curing process, as well as saltpetre (potassium nitrate). The potassium nitrate in saltpeter kills Clostridium botulinum, the deadly bacterium that causes botulism, while the acidity of the vinegar inhibits its growth. According to the World Health Organization, C. botulinum will not grow in acidic conditions (pH less than 4.6); therefore the toxin will not be formed in acidic foods. The antimicrobial properties of certain spices have also been drawn upon since ancient times. The spices introduced to biltong by the Dutch include pepper, coriander, and cloves. In January 2017, a research group at the University of Beira Interior in Portugal published a study on the antimicrobial properties of coriander oil (coriander being one of the main spices in the most basic of biltong recipes) against 12 bacterial strains, and found that 10 of the 12 strains of bacteria were killed with a relatively mild concentration of coriander oil (1.6%). In the two strains that were not effectively killed, Bacillus cereus and Enterococcus faecalis, the coriander oil reduced their growth significantly. The need for food preservation in South Africa was pressing. Building up herds of livestock took a long time, but with game in abundance in South Africa, traditional methods were called upon to preserve the meat of large African animals such as the eland in a warm climate. Iceboxes and refrigerators had not been invented yet. Biltong as it is today evolved from the dried meat carried by the wagon-travelling Voortrekkers, who needed stocks of durable food as they migrated from the Cape Colony north and north-eastward (away from British rule) into the interior of Southern Africa during the Great Trek. The meat was preserved and hung to be dried for a fortnight during the colder winter, with the cold temperatures aiding to further inhibit bacterial and fungal growth. Once suitably dried, the biltong was ready for packing in cloth bags, which allow air circulation to prevent mould. Modern-day ingredients sometimes added include: balsamic vinegar or malt vinegar, sugar, dry ground chili peppers, nutmeg, paprika, lemon juice, garlic, bicarbonate of soda, Worcestershire sauce, onion powder, and saltpetre. Prior to the introduction of refrigeration, the curing process was used to preserve all kinds of meat in South Africa. However, biltong is most commonly made today from beef, primarily because of its widespread availability and lower cost relative to game. For the finest cuts, fillet, sirloin, or steaks cut from the hip such as topside or silverside are used. Other cuts can be used, but are not as high in quality. Fish in this case, known as bokkoms (shark biltong can also be found in South Africa). Bokkoms should not be confused with other cured fish such as dried angelfish and dried snoek. Traditionally biltong was only made during the cold winter months when the risk of bacterial growth and mould would be at a minimum. Some recipes require the meat to be marinated in a vinegar solution (grape vinegar is traditional but balsamic and cider also work very well) for a few hours, then the vinegar is poured off before the meat is flavoured with salt and spices. The spice mix is sprinkled liberally over the meat and rubbed in. Saltpetre is optional and can be added as an extra preservative (necessary only for wet biltong that is not going to be frozen). The meat should then be left for a further few hours (or refrigerated overnight) and any excess liquid poured off before the meat is hung in the dryer. Other recipes, which were handed down from generation to generation, require the biltong to be left overnight in the vinegar, salt, and spice solution (between 12 and 24 hours). The spice mix traditionally consists of equal amounts of rock salt, whole coriander (slightly roasted), roughly ground black pepper, and brown sugar. The vinegar serves as a primary inhibitor of Clostridium botulinum bacteria, according to WHO (the World Health Organisation), while the salt, coriander, pepper, and cloves all have antimicrobial properties. Traditionally biltong was made during the cold winters of the South African Highveld for best results. The cold, dry air typically dried out the biltong much more effectively, and in the best possible food safety environment. Mould and bacterial risk are at a natural minimum, and thicker biltong cuts can be hung to dry slowly for a richer texture, fuller flavor and dark colour. Heat has only been introduced into the process in recent years, and traditional biltong makers maintain that heat makes for an inferior end result. Due to increased risk of bacterial and fungal growth, the heated method, such as that used in cardboard or wooden biltong boxes (urban) or climate-controlled dry rooms (commercial), cannot be used without the addition of nitrates or nitrites (curing salts). Depending on the spices used, a variety of flavours may be produced. Biltong can also be made in colder climates by using an electric lamp to dry the meat, but care must be taken to ventilate, as mould can begin to form on the meat. A traditional slow dry will deliver a medium cure in about four days. An electric fan-assisted oven set to 40–70 °C (100–160 °F), with the door open a fraction to let out moist air, can dry the meat in approximately four hours. Although oven dried is ready to eat a day or two after preparation, traditional biltong makers still consider slow dried meat to be safer and of superior quality. The meat used in biltong can be much thicker due to the slower drying time in dry air conditions; typically biltong meat is cut in strips approximately 1" (25 mm) wide – but can be thicker. Jerky is normally very thin meat. There are also specialised retailers that sell biltong. These shops may sell biltong as "wet" (moist), "medium" or "dry". Additionally, some customers prefer it with a lot of fat, while others prefer it as lean as possible. Biltong can be used as a teething aid for babies. Biltong is a high-protein food. Often, 200 g of beef are required to make 100 g of biltong, and the process of making biltong preserves most of the protein content. Some biltong can have up to 67% protein content. In the United States, biltong is relatively rare as beef jerky has been traditionally the more popular dried meat snack. Within the last five years[when? ], biltong has begun a small emergence within the United States, particularly from South African immigrants who have brought their local culture and foods with them. This has been most common in affluent areas of major cities where the local population can afford to purchase it. ^ Eric Partridge (20 September 2006). Origins: An Etymological Dictionary of Modern English. Routledge. ISBN 978-0-203-42114-7. Retrieved 24 September 2008. ^ "Botulism". World Health Organization. ^ Beinart, William (29 May 2008). The Rise of Conservation in South Africa. Oxford University Press. ISBN 9780199541225. ^ Silva, Filomena; Domingues, Fernanda C (2015). "Antimicrobial Activity of Coriander Oil and Its Effectiveness as Food Preservative". Critical Reviews in Food Science and Nutrition. 57 (1): 35–47. doi:10.1080/10408398.2013.847818. PMID 25831119. ^ Rockland, Louis B.; Beuchat, Larry R. (1987). "Intermediate Moister Foods". Water Activity: Theory and Applications to Food. CRC Press. p. 318. ISBN 978-0-8247-7759-3. Retrieved 29 September 2008. ^ Arora, Dilip K.; Arora, Bharat Rai (1991). "Xerophilic Fungi in Intermediate and Low Moisture Foods". Handbook of Applied Mycology. CRC Press. p. 74. ISBN 978-0-8247-8491-1. Retrieved 29 September 2008. ^ Madikwa, Zenoyise (25 September 2008). "Making biltong is really simple". The Sowetan. Retrieved 29 September 2008. ^ Wylie, Diana (2001). Starving on a Full Stomach: Hunger and the Triumph of Cultural Racism in Modern South Africa. University of Virginia Press. p. 83. ISBN 978-0-8139-2068-9. Retrieved 23 September 2008. Sometimes the food donated as famine relief were memorably bizarre, and surprisingly popular, such as shark biltong (dried shark meat). ^ Heemstra, Elaine (2004). Coastal Fishes of Southern Africa. NISC (PTY) Ltd. pp. 63–64. ISBN 978-1-920033-01-9. Retrieved 23 September 2008. [T]he meat [of the soupfin shark] is dried, salted and sold as shark biltong. ^ "Making Traditional South African Biltong - A Recipe - SA-Austin.com". www.sa-austin.com. ^ d'Amato, Maria Eugenia; Alechine, Evguenia; Cloete, Kevin Wesley; Davison, Sean; Corach, Daniel (2013). "Where is the game? Wild meat products authentication in South Africa: A case study". Investigative Genetics. 4 (1): 6. doi:10.1186/2041-2223-4-6. PMC 3621286. PMID 23452350. ^ "Recipe: Homemade Jerky in the Oven". ^ Melrose Cheese Spread. "Melrose Cheese Spread". SaffaTrading.co.za. Retrieved 10 August 2018. 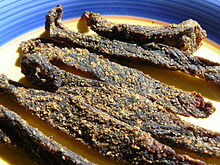 ^ "South African biltong recipes". www.biltongshopper.com. ^ HMRC. "FAQ: Meat, food and plants". Her Majesty's Customs and Excise. Archived from the original on 2 February 2009. Retrieved 10 September 2007. 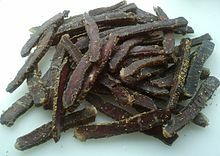 Wikimedia Commons has media related to Biltong.